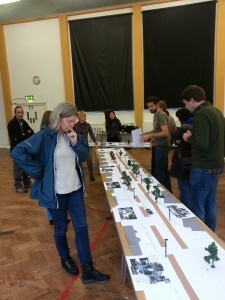 10 November 2012 was a damp autumnal Saturday afternoon and saw the second stage of the Lambeth Green Streets project kick off. 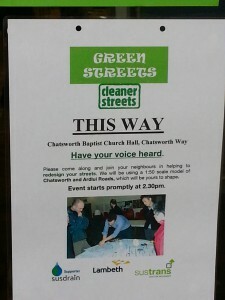 The local church hall in Chatsworth Way was the venue for the consultation workshop to engage with those living on and around Chatsworth Way and Ardlui Road (see below). 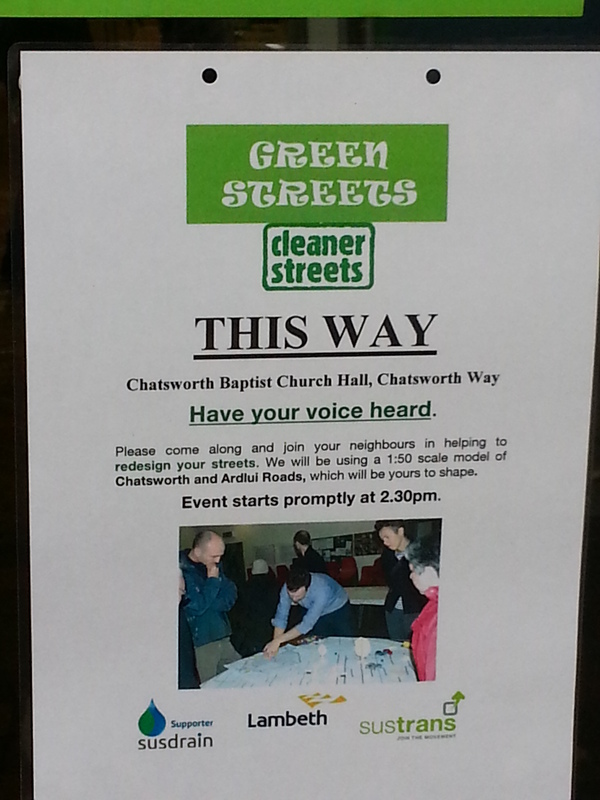 The primary purpose of the gathering was to further engage with the residents and public allowing them to share and discuss some problems they’re currently experiencing and more importantly explore opportunities to “green” their local streets. 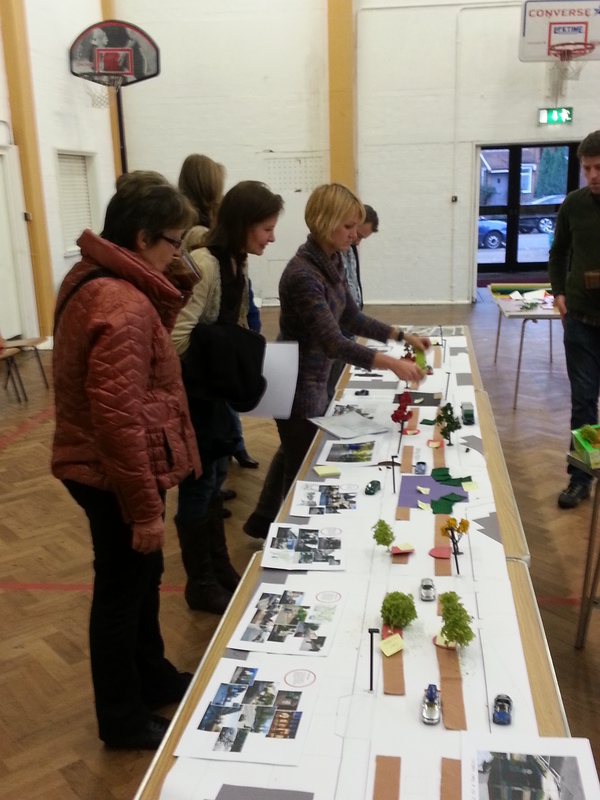 Broad concepts of traffic calming and beautifying their roads with rain gardens and other green infrastructure were discussed and presented to residents on 1:50 scale maps, with existing trees, lampposts and parking imaginatively presented on the maps (see photos). Feedback was very forthcoming on what residents wanted, what they were worried about and a two way dialogue built on the foundation of trust and transparency was apparent. Approaches to traffic calming, place making, SuDS and green infrastructure were discussed with the residents and they were encouraged to focus on opportunities and solutions. 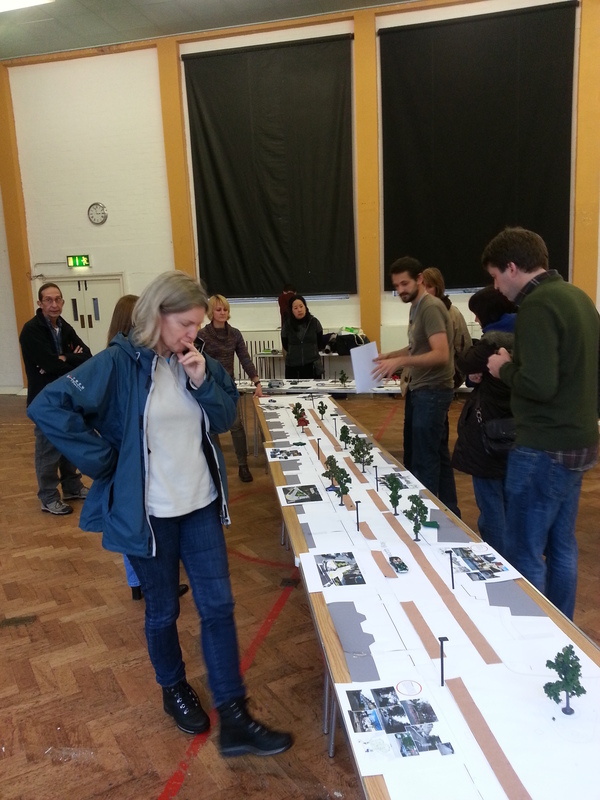 The ultimate aim was to get residents views on how the roads could be changed to make them greener and safer and at the same time improve the management of surface water runoff. This was achieved by cutting pieces of coloured felt and card to demonstrate rain gardens, raised junctions, vegetated chicanes etc and general changes to the road with annotations being provided by the ubiquitous post-it note! (see photos). 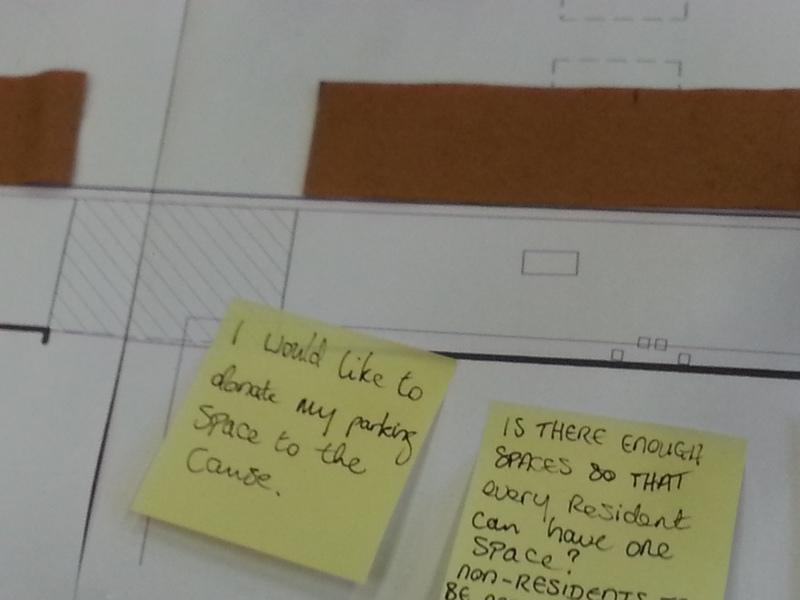 This informal and fun process gently informed the residents as to what could be possible, the implications and as a consequence provide them with the necessary skills to make helpful contributions and decisions when more detailed designs are discussed with them or their neighbours in the future. This is all part of working with the residents, getting alongside their aspirations and ambitions for their local environment, helping them to make a contribution into future stages of the process, reducing the chance of surprises. The residents were generally very enthusiastic; benefits relating to providing greener and safer roads were balanced with concerns about parking. Some residents were happy to walk to their parked cars, providing opportunities for their footways and roads to be greened, while others wanted more opportunities to park outside their house and minimal greening on their road. This was an encouraging foray into the approach to engage with the community, elicit views, opinions and start an inspiring collaborative design process with practitioners and professionals working alongside the community. The next stage in the New Year will be to share thoughts on initial designs.